A collection of book reviews. "Clara had long suspected that Paolo was going to propose soon. They'd been together for four years, and recently he'd been trying to tell her something, but always postponed at the last minute. He would get nervous, his hands would go cold and sweaty, and his words would get tangled. This was a clear signal that what he wanted to say was important, but perhaps, he didn't quite know how to say it. Clara had decided to make things easier for him, so she's suggested, on this occasion, that they ought to go for a romantic walk by the mountains. He loved being outdoors, and particularly hill walking." 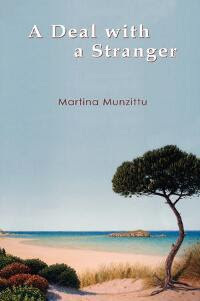 A Deal with a Stranger by Marina Munzittu is set in Sardinia, in the city of Cagliari, we follow the story of 25 year old Clara, as -day by day- her world destabilises a little more, starting with meeting an old man in a forest. The plot is an interesting one, varying between predictable and completely new. Or rather there are elements that are predictable. I would say the romance was a little, just because we've seen it a million times, but that doesn't mean the plot or writing is bad. I'll come back to this in a second, but I want to talk about the plot itself first. The concept is fantastic. I think the idea of a stranger coming into your life and making this kind of deal with you (not giving anything away) is original and thought-provoking and this mixed with the consequences (and some bad luck) lead to an unusual turn of events. The nonsensical logic and unlikeliness of it all are still realistic and kept me hooked. Back to the romance. Anyone who loves a good, light romance novel will like this. It's nothing new, but mixed with the plot it works. And no one says it has to be new to work. There's a reason the old formulas are used. The characters themselves- I have to admit, I didn't like at the start. They seemed a bit stereotypical and could sometimes be unnecessarily cruel and harsh, but they do grow on you and become more human as the story progresses and more is revealed about them and we see them deal with the good, the bad and the ugly. Something of a side note here, but I also enjoyed the description of the foods mentioned. Our protagonist had a bit of a weakness for delicious food and doesn't spare the details when describing them. But be warned, you will want something delicious to munch on when reading this book. Overall, I enjoyed the story. I wasn't immediately pulled in, but I'm glad I kept reading as I got a good read out of it. I would recommend this book to anyone with an interest in Italy or a lover of romance novels. If you're travelling to Italy soon and want a light, holiday read, why not try this one out. Disclaimer: This was sent to me by the author through a giveaway. This is not a sponsored review. All opinions are 100% my own. Georgia has read 0 books toward her goal of 100 books. I'm a book reviewer. Not for a living, just for fun, and to share my insights and opinions with whomever wants to read them. I know how much I like to know whether something's good before I buy it, not that I always pay attention to the advice. And I definitely love to know about hidden gems and discovering new great books. If you want anything reviewed, just send me a message with the details and I'll do my best. Woke Up in Medieval England as a Fox? What If Souls Were Given and Could Be Taken?